A 14 year-old male complains of back pain during exercise. A sagittal T2-weighted view of the thoracic spine is provided. What are the findings? What is the diagnosis? 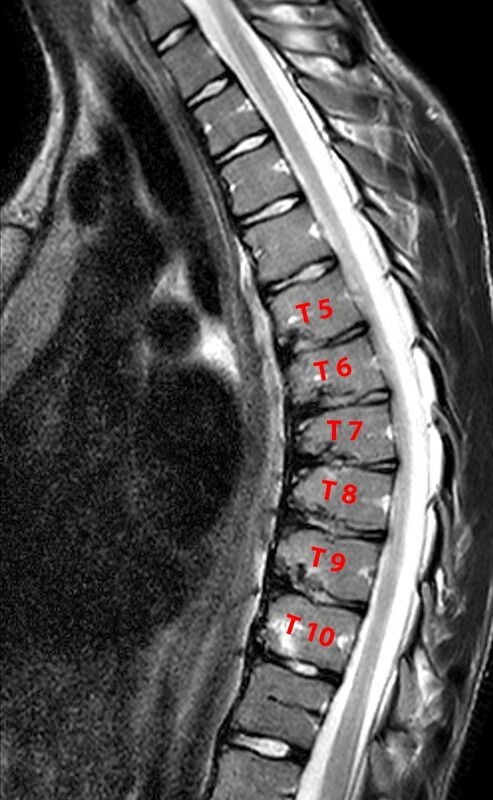 The Sagittal T2-weighted image of the thoracic spine demonstrates an exaggerated kyphosis with mild anterior wedging of the T5 through T10 vertebral bodies. Signal loss is present in multiple intervertebral discs with associated endplate irregularity and Schmorl’s nodes. Several theories exist regarding the etiology of SD. Defective formation of the endplate related to abnormal collagen formation has been proposed, and there is a reported increased incidence of concurrent juvenile osteoporosis. Twin studies by Damborg et al. have demonstrated a significant genetic component, with suspected autosomal dominant transmission.3,4 Mechanical stress is generally accepted as a contributing factor, with increased incidence seen in athletes who participate in sports requiring significant flexion/extension, and in young manual laborers. Increased release of growth hormone may also be a factor; patients with SD are typically taller and heavier than their peers. The Cobb angle is measured as 46 degrees; intersecting vectors are drawn from the superior endplate of T2 to the inferior endplate of T10, representing the boundaries of the kyphotic curve. A Sagittal T2-weighted image of the lower thoracic and lumbar spine in this 15 year-old female shows anterior wedging of the T11, T12, and L1 vertebral bodies, with associated endplate irregularity from T11 to L2. Mild posterior wedging of the L2 vertebral body is also noted. The findings are consistent with “Scheuermann-like disease” involving the thoracolumbar junction. Note that kyphosis is not a prominent feature. There is a higher long-term incidence of back pain and disc disease in patients with “Scheuermann-like disease” affecting the thoracolumbar or lumbar spine than in patients with classic thoracic SD. Scheuermann’s disease is a notable cause of back pain and kyphosis in adolescents. Identification of features of SD and determination of the degree of kyphosis is helpful in determining operative vs. non-operative management. “Scheuermann-like disease” at the thoracolumbar junction or in the lumbar spine is an important prognostic indicator of back pain in later life.